Most South Koreans welcome the ongoing rapprochement between the two Koreas, highlighted by the two historic summits between their leaders, but for many reasons besides just the peace it may bring. Many, of course, are simply glad to finally see some sort of detente between the two Koreas following a series of nuclear and missile provocations by the communist North in recent years. "It is a relief just to know that North Korea will not stage any provocations, at least for some time," said Kim Ki-hoon, a 35-year-old office worker in Seoul, adding he had even considered moving overseas when North Korean provocations were at their peak. Pyongyang launched more than 10 mid- and long-range missiles in less than eight months after South Korean President Moon Jae-in came to office in May last year and staged its sixth and most powerful nuclear test in September. "When I come to think about it, I guess we have all lived under the possibility of war throughout my entire life. We are just too numb to realize that," Kim said. Song Si-yeol, a 52-year-old physician, says he has four gas masks and a matching number of first-aid and ration kits at home for his family, just in case. "After (North Korean leader) Kim Jong-un took power, I was certain North Korea would try something crazy before it collapsed," Song said of his ongoing preparations for a conflict. The father of two still stores 20 liters of water for each of his four family members, which he says is enough to keep them alive for 30 days, and replaces the entire stock every six months. "I am still not entirely convinced Kim Jong-un wants peace, but I do not oppose the ongoing dialogue with North Korea," he said. The talks with the reclusive North began with a historic inter-Korean summit held in the border town of Panmunjom on April 27 -- the first of its kind in more than a decade and the third in history. Moon and Kim met again in Panmunjom on May 26, less than three weeks before Kim and U.S. President Donald Trump held an unprecedented U.S.-North Korea summit in Singapore on June 12. Inter-Korean dialogue has since expanded to various other areas, including military, cultural and even economic cooperation, as the North Korean leader repeatedly declared his commitment to complete denuclearization and the establishment of lasting peace on the Korean Peninsula. 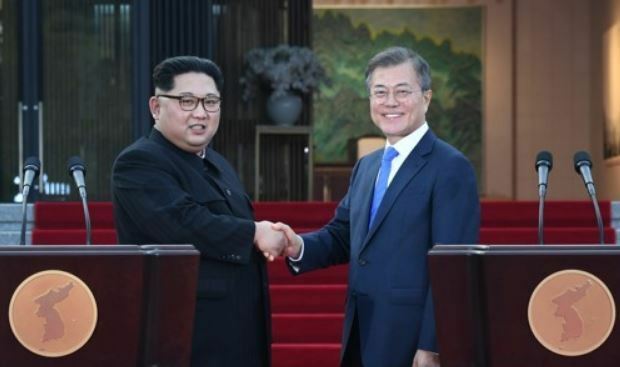 While most, like Kim and Song, welcome such dialogue for the peace it might bring, many others apparently want peace for other reasons, some for economic gains and others out of motherly love. In just a few days following the April 27 summit between Moon and Kim, land prices in South Korea's border town of Paju skyrocketed as people rushed to purchase a piece of what would be the central region of a unified Korea. In April, land prices in Paju, just south of the inter-Korean border, jumped 1.77 percent from the previous month, far surpassing the average 0.33 percent for the entire nation and the 0.30 percent increase for Seoul, according to a report from KB Financial Group. Many others are apparently betting on peace -- or at least improved relations -- between the two Koreas. In the first half of the year, stocks of local firms expected to most benefit from inter-Korean reconciliation or economic cooperation took up six out of the top 10 spots for shares with highest price increases, according to Korea Exchange. Such firms include cement and construction companies -- a clear indication that many in the South believe inter-Korean reconciliation will lead to major construction projects in the impoverished North. They also include pharmaceutical firms, as the North is said to be suffering from a chronic shortage of even the most basic medicines and medical supplies. "We have not yet come up with any business plans, but it could certainly help boost our sales should we be able to ship medicine to North Korea," an official from a local pharmaceutical company said, asking not to be identified. Still others want peace for their children, especially their sons. "I mainly wish for peace so my sons and their children may live without the fear of war that I had to live with," said Jin Mi-jeong, a 49-year-old mother of two from Seoul.